Do you know that you have a special friend who loves you with all His heart, a friend who is strong and gentle and kind, a friend you can talk to at any time, a friend who is always willing to listen to you and help you? You may wonder, "Who is this special friend?" He is God's Son, the Lord Jesus Christ! He loves you with all His heart. He is the best Friend you could ever have! This best Friend lives in a special place. What is this special place where the Lord Jesus lives? It is called Heaven. Heaven is God's home. Jesus called it "My Father's house." You cannot imagine how beautiful it is. What is Heaven like? The best way to tell you what Heaven is like is to tell you about the things that will be in Heaven and the things that will not be in Heaven. First, we will think about the things that will NOT be in Heaven. The sun and the moon will not be in Heaven. We need them here, but in Heaven there is never any darkness. The glory of God is the light of that beautiful place. There will be no sin in Heaven. The spots in this heart stand for sin. We cannot go to Heaven with sin in our hearts. There will be no church buildings in Heaven. We go to church to worship God, but in Heaven we will be living with God. He will be our God and we will belong to Him forever. We will not need any medicine in Heaven because no one ever gets sick. There will be no tombstones in Heaven because no one ever dies. God is going to wipe away all tears. There will be no sickness, no sorrow, and no heartaches in Heaven. No one ever gets tired and no one grows old. There will be millions and millions of God's children there. All our friends and loved ones who trusted the Lord Jesus as their Savior will be there. We will know them and they will know us. God will give special crowns to those who loved the Lord Jesus and served Him here. God's holy Word, the Bible, will be there. God has said that His Word will never pass away. It will always be with us. There is another book in Heaven. 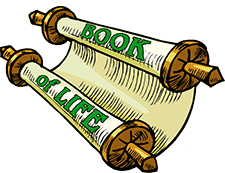 This book is called "The Lamb's Book of Life." The Lord Jesus is "the Lamb of God," so this is His book. When you take the Lord Jesus as your Savior, your name is written in "The Lamb's Book of Life," and you know that you will be with Jesus in Heaven forever. The Tree of Life will be in Heaven. This tree will bear twelve different kinds of fruit. There will be beautiful homes in Heaven—far more beautiful than anything we can imagine. Even the street of Heaven is made of pure gold. Millions of angels will be there. Angels are God's servants. God sends His angels to watch over us while we are here on earth. 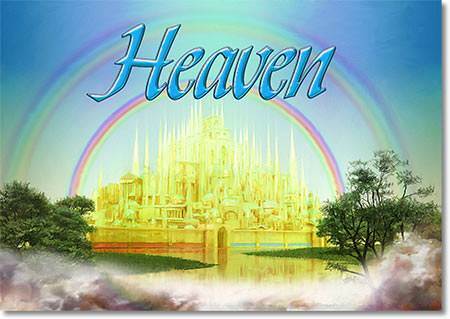 The most wonderful thing about Heaven is this: the Lord Jesus will be there! We will see our Savior face-to-face, the Son of God who loves us so much that He gave His life for us. If you ask anyone in Heaven how they got there, they will point to Jesus and say, "It is all because of Jesus and what He did for me." 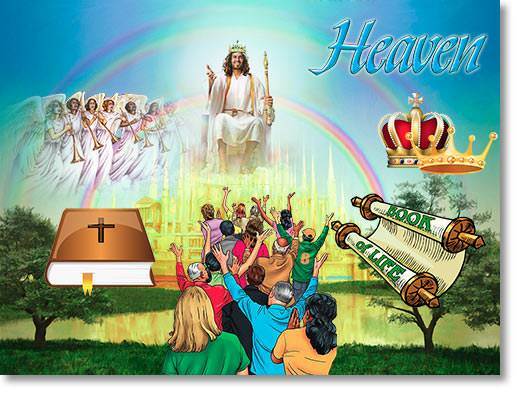 In Heaven everyone loves and praises Jesus. God wants you in Heaven with Him! Do you know why God wants you in Heaven? He wants you there because He loves you! You can say, "God loves ME!" Say it right now. Point to yourself and say it again: "God loves ME!" 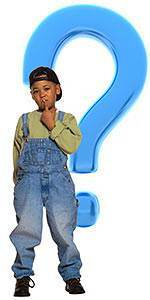 You may be thinking, "Does God know about all the bad things I have done and all the lies I have told?" Yes, God knows all about them, but that does not keep Him from loving you. He loves you just the same. "For God so loved the world, that He gave His only begotten Son, that whoever believes in Him should not perish, but have everlasting life" (John 3:16). When you believe on the Lord Jesus and take Him as your Savior, God forgives you of all your sins and makes you His child forever. As a child of God, you can know that you will go to Heaven some day. "Lord Jesus, I know that I have sinned. I am truly sorry for my sins, and I want to stop doing them. 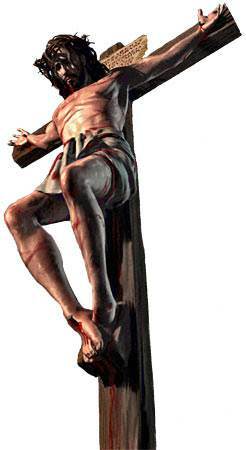 I believe that You are the Son of God and that You died on the cross for my sins. Please come into my heart. I am taking You as my Savior right now!" 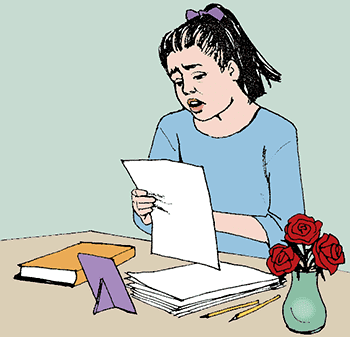 Maria closed the door quietly and tiptoed over to the teacher's desk. Now, if she could only find that list! It had on it all the names of those who were to sing at the retirement home the next week. "Oh, I hope my name is on it," Maria whispered to herself. Quickly she began to hunt among the papers on the desk. At last she saw the list under the edge of a book. Maria pulled it out and read the names eagerly. "Oh no," she thought. "My name isn't on it! 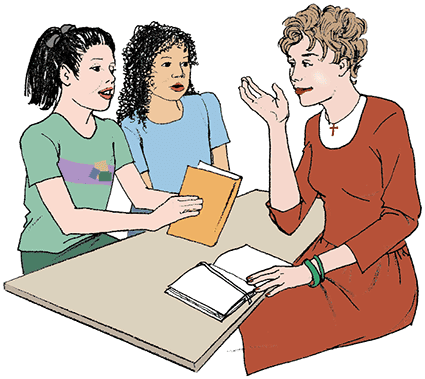 "That mean old teacher," Maria muttered, tears stinging her eyes. "She knows my grandmother is in that home. And I wanted to go and sing especially for her." With an angry jerk, Maria tore the list in half and pushed it deep into the trash can. Then she rushed out of the room. Maria turned slowly. Her teacher, Miss Wilson, was just coming out of the school office. "What are you doing here, Maria?" she asked. Maria's heart pounded as she said, "I-I went back to put away a book." "Well, run on home now. You know you should not be here," Miss Wilson said impatiently as she hurried off. With a sigh of relief, Maria left the building and ran toward home. 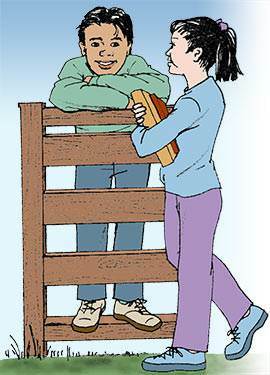 Her brother Steven was swinging on the gate, watching for her. "I bet you had to stay after school," he said with a grin. "I did not," Maria snapped back, trying to push past him. "Is Mother home yet?" "No," Steven said, scowling. "And Mother and Daddy are going away tomorrow as usual. This time you are to stay with cousin Anna. But I have to go to dull Uncle Bill's again." Maria looked at her brother's unhappy face. He was only a year older than she was. It didn't seem fair that he had to spend so much time at Uncle Bill's gloomy house. "If only Grandma still lived here," Maria thought sadly. "Then Steven and I would not have to stay with relatives so often." The next day the hours passed swiftly as Maria and Anna played together. Maria enjoyed spending time with her cousin. When they were getting ready for bed that night Anna said, "Tomorrow we will go to Sunday School and church. It is really great! You will like it a lot." Maria was not sure about that. But the next morning as they entered the Sunday School room, she saw what Anna meant. The teacher was young and cheerful. The other boys and girls seemed happy and eager to begin learning about God. "Today we are going to talk about a wonderful place called Heaven," the teacher began. "Heaven is God's home. Heaven is where God lives. His Son, the Lord Jesus, lives there too. It is a very beautiful place and it is full of joy. Nothing mean or bad can happen in Heaven. No one will ever get sick there. And no one will die in Heaven. "The reason Heaven is such a wonderful place is because there is no sin there." Maria nudged Anna. "It's not a true story," she whispered. "Everybody dies, you know they do." Anna shook her head. Then she held up her hand and asked, "Teacher, is this really a true story?" "Yes," the teacher smiled as she answered. "It is all written in God's Book, the Bible. Best of all, the message of the Bible is that we can go to Heaven and live there with Jesus forever." "How?" Maria asked the question without thinking. "It's like this," the teacher explained. "We are happy when our name is written on a special list or honor roll. The most important place to have our name written is in 'The Lamb's Book of Life.' This book is in Heaven. It belongs to the Lord Jesus. All who have their names written in this book will go to Heaven. Jesus will write your name there if you take Him as your Savior. We are never too young or too old to have our names written in 'The Lamb's Book of Life.'" The teacher held up a large sheet of paper with a Bible verse printed on it. "This verse is found in Revelation 21:27. It tells us that all who do bad things and tell lies cannot go to Heaven. Only those who have their names written in 'The Lamb's Book of Life' can enter Heaven." While the rest of the class read the verse aloud, Maria sat very still. She had suddenly remembered the torn list and the lie she had told Miss Wilson. "It's no use," Maria thought. "I didn't get my name on the list at school. And now Jesus will not put my name in His beautiful book either." Maria was so troubled she didn't hear another word the teacher said. Right after church Maria's father came and hurried her into the car. "Anna," Maria whispered as she was saying goodbye, "can a person who has told a lie ever get her name into God's Book?" "Yes," Anna answered quickly. "If they are truly sorry and confess it. Jesus will—" Just then Maria's father started the car and Anna's words were blown away as the car sprang forward. Maria leaned back with a sigh. "Did Anna mean I would have to tell Miss Wilson about that lie?" she wondered. "I could never do that." Her head was full of questions. She glanced at her father but his mouth was set in a grim line. "He doesn't like to answer questions anyway," she thought. "Only Grandma ever has time to answer questions. I've just got to see her. And I will go singing with the group next Friday—somehow I will go." Poor Maria—What WILL she do about the list? Will she get to see her grandmother? Don't miss the next chapter—coming in your NEXT lesson!